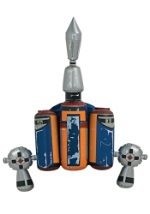 Become the most notorious bounty hunter in the galaxy when you go in this affordable Star Wars costume for adults! The polyester shirt is dark gray with many screenprinted details on the front recreating Boba Fett's armor and belt. The sleeves also have his shoulder guards and gauntlets printed on them. The shoulder features a dark green cape that attaches at the shoulder with Velcro. The plastic half mask is molded to look like the character's and includes a clear tinted portion for seeing. The mask has elastic that goes around the back of the head. 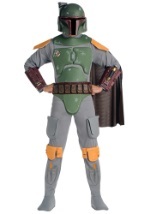 No need to spend all your Imperial credits this Halloween, just get this affordable Boba Fett costume!